NoiseFold explain their recent network performance exploring artificial life based system. NoiseFold 2.0 is a live cinema and sound art-work consisting of an indeterminate sequence of animated movements or chapters presented as an extensible multi-screen video panorama. The work is facilitated by a complex audio-visual software system designed by the artists that generates or breeds a seemingly infinite array of virtual agents. These synthetic audio-visual forms result from the live mixing of a growing database of dynamic equations that are folded and recombined through a multi-threaded data feedback structure. 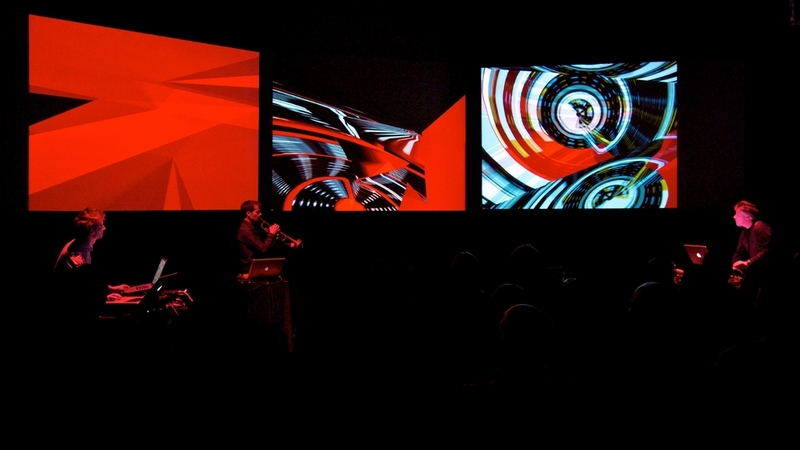 The resulting sound is not a separate aural accompaniment but rather the direct sonification of the visual data itself. Thus the performers interact with autonomous visual forms to grow, and sculpt the sonic content of the performance. The architectural scale and network complexity of 2.0 is usually limited by the fact that it is a touring performance and all hardware must fit inside four carry-on luggage items. The resulting design facilitates travel and exhibition in a wide variety of venues from museums, galleries, concert halls and cinemas to planetariums, botanical gardens and black box theaters. The system has been designed as an extensible network that allows for the interconnection of 2 or more computers feeding 2 or more projection displays. All data can be shared between performers allowing for the artists to control their own individual screen, or perform inside each other’s screen-space, or adopt global control across all screens at once. 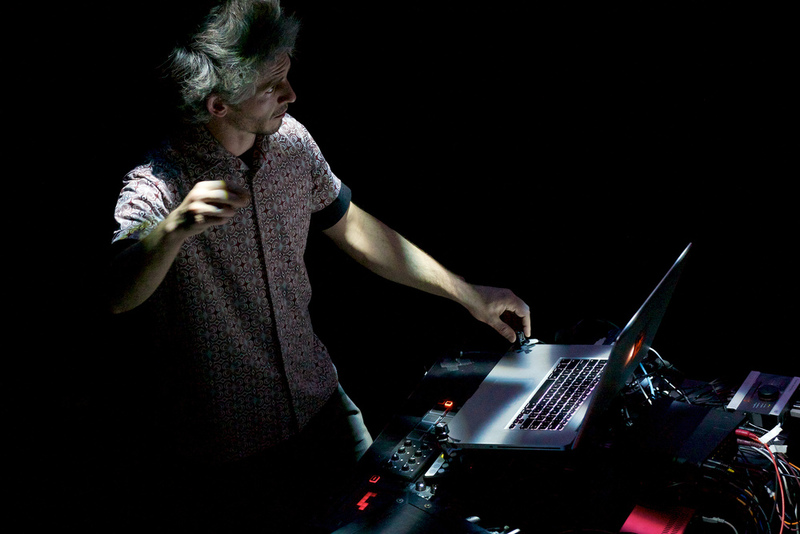 Unlike a typical laptop performance, NoiseFold 2.0 explores the possibility of embodied physical control through gesture capture and acoustic sound input, which is further augmented by foot pedals and conventional control surface interfaces. The primary system input is provided by infrared sensors that the performers manipulate in much the same manner as a playing a Theremin. The IR sensors are capable of a high resolution data capture that facilitates very subtle gestural interactions that can be assigned to hundreds of parameter offsets guiding the behavior of the audio-visual forms. Handheld parabolic microphones are used to channel acoustic frequencies in the performance space back into the system to effectively cause the visual forms to grow or mutate. As an Artificial Life system NoiseFold 2.0 can be viewed as a “parthenogenesis machine” that is able to produce a wide array of behaviors including exotic bio-mimetic forms. These virtual objects could be viewed as an artistic end in and of themselves, serving the purpose to visualize hypothetical geometries and compelling aesthetic abstractions. NoiseFold 2.0 pursues a more critical objective. As in a fairytale, this seductive visual language serves to draw the audience more deeply into the forest. In fact, Stout and Metcalf are working in a larger context of data dramatization that examines the nature and intent of human control within large chaotic systems whether environmental, biological, political or social. 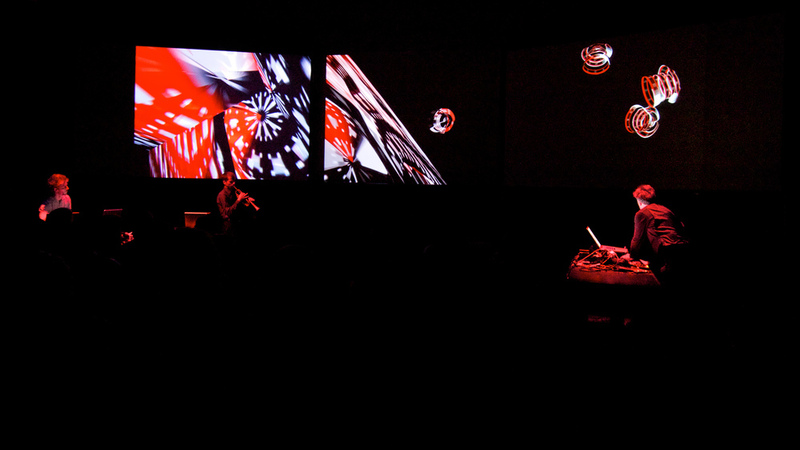 The resulting abstract audio-visual forms or A-Life organisms are actually unstable structures that challenge the performers to maintain control or risk a variety of consequences. The forms can emit harmful and noxious sounds. They can escape off screen. They can shrink and die. They can multiply in number, scale and complexity threatening to choke all system resources, or they can explode with alarming sonic consequences. The NoiseFold performers have routinely been compared to necromancers and more often acknowledged as wild animal tamers, not only because of the grand gestures required to play the system but because the system itself exhibits unpredictable and often hostile traits. One possible response to dangerous unpredictable behavior is for individuals, communities and nations to exert ever more invasive forms of control. This idea is adopted in the 2.0 performance in several ways. Over time the sonic elements are seen to transform from chaotic noise-based textures to become increasingly tonal. Simultaneously the forms can move from isolated and individuated screen space to become communities or larger scale visual compositions joining all screens in a single form or image. In the final stages the original lyric forms become increasingly architectonic, ultimately joining in a propulsive display of dystopian aggression. Interestingly there is no libretto or designation of anthropomorphic characters, no text, dialogue or illustrative music. Instead the audience must meet the work half way to assign significance or not to the emergent audio and visual codes at play within the performance.